During pregnancy and often seen after you have had your baby, you may notice an abdominal bulging when you sit up from lying down. Sometimes in mid to late pregnancy, the layers of abdominal muscles and connective tissues separate as the uterus expands in response to the baby growing. It is more common in women with multi-births, women who are extremely fit and have a very toned ‘core’ and non-exercising pregnant mums. Clinically I see each end of the body type spectrum, ie. women with very tight muscles and difficulty stretching and women who are hypermobile and can ‘overstretch’ their joints. Both body ‘types’ may be more likely to develop tummy separation. There is still no one reason why this may affect some mums more than others and the Women’s health physios are still divided about how much abdominal support to give post natal to mums with rectus diastasis. This condition of pregnancy is NORMAL and post natal, after the baby is born, should resolve over 2-6 weeks. However some mums may have significant stomach separation when they are due to leave hospital. These mums should be fitted with an abdominal binder. If there has been a caesarean section then mums may have abdominal ‘tubigrip’ to help support the tummy. They may go into a more supportive ‘cross over ‘ binder after a few weeks if indicated. 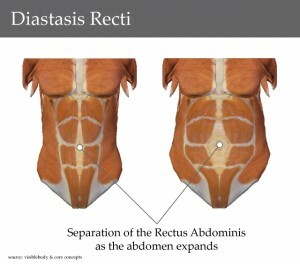 The separation of the rectus abdominus or stomach muscles starts at the umbilicus (belly button) and spreads up towards the ribs and down towards the pubic bone. 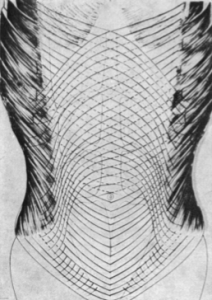 We can measure both the length – top to bottom, the width – across the tummy and the depth – how deep the separation goes. Sometimes this may feel weird – especially if you can easily push your finger tips into you tummy!! Don’t worry you are not alone. Mums all over the world have this after their baby. How to tell if you have a DRA. This is a great video link on self assessment of your tummy. Sometimes physiotherapy is not enough for significant separation >10cm. Working on the deep transverse Abdominals is vital to gain some functional stability but these women may go on to have an Abdominoplasty. Sue’s blog on this subject is helpful. The Fit2be website has a lot of useful information on how to rehab your DRA. I think the most important message it really does give…is crunches and traditional Ab exercises don’t work and are positively harmful for DRA repair. This website is a great resource to explain what I can do to help you re-educate the deep TVA muscles to support the deep fascia allowing the diastasis to be in a be in a more functional position. These two pictures are taken before and after some education and training of the deep system TVA and fascia.. She has had 2 sessions and this is a check up. She wears a belt for some of her day. At this point she was 5 months post vaginal delivery. This is a significant DRA. Individual assessment is the only way I can advise you on support and progressive exercise options. Just make sure you have your tummy checked before you leave the hospital and ask for abdominal support if indicated. I may use SRC core recovery shorts, different Abdominal binders and sometimes combinations of both. Different support for different stages of rehab. Early support, deep core activation and education on ways to help support and heal your tummy are part of my approach to getting you back in shape. Call 9958 8986 today and ask for an ‘Assessment of tummy muscles after baby’ – 30 minutes. If you have pelvic floor concerns it will be necessary to do a full pelvic floor assessment 1 hour. Costs on enquiry. I look forward to meeting you and guiding you back to functional fitness.